Evelyn B. Blaker, 97, Beatrice died Tuesday, January 29, 2019 at the Homestead House in Beatrice. 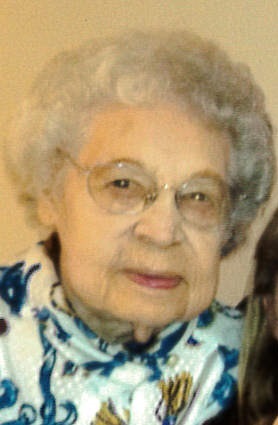 She was born May 24, 1921 at the Lutheran Hospital in Beatrice. She married Francis Blaker. Evelyn worked as a switchboard operator for 17 years at the Beatrice State Developmental Center, after she retired she volunteered at the Bargain Box and enjoyed going to the Senior Center. Survivors include sons, Dennis Blaker and wife Karen of Lincoln, and Garold Blaker and wife Denise of Beatrice; grandchildren, Vickie Kauffold and husband Andy of Omaha, Steve Blaker of Lincoln, Tracey Blaker of Kansas City, MO, David Blaker and wife Angela of St. Joseph, MO and Tiffany Blaker of Lincoln; great-grandchildren, Rachel Kauffold of Denver, Hannah Ketcham and husband Matt of Austria, Allysa Blaker and Ryan Blaker both of St. Joseph, MO; great-great-grandson, Leo Ketcham of Austria. She was preceded in death by parents, George and Augusta (Emko) Barber; husband Francis (1995); son, Rodney (1992); 9 brothers and sisters. Services at a later date her body was donated to the Nebraska Anatomical Board. Memorials are established. A guestbook is available at www.harmanwrightmortuary.com Harman-Wright Mortuary in charge of arrangements.